How to Write a Book in a Day..."This One Was"
Product prices and availability are accurate as of 2019-04-19 06:28:46 UTC and are subject to change. Any price and availability information displayed on http://www.amazon.com/ at the time of purchase will apply to the purchase of this product. Author Bookstand is proud to offer How to Write a Book in a Day..."This One Was" by Bookstand Publishing. Bookstand Publishing offers books by the best indie authors throughout North America and the world. Bookstand Publishing is dedicated to offering original content to a broad audience and promoting great authors, literacy, and freedom of expression. 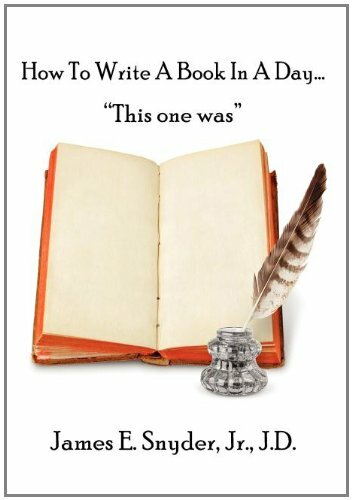 How to Write a Book in a Day..."This One Was" has generated a lot of interest and excitement and we think it would be an excellent addition to your library. You can write a book in a day. The author of nineteen books (eight are multiple editions) including two treatises, a novel, a prayer book, and even a dictionary, shows you how it's done. How To Write A Book In A Day...was. It might as well have been entitled How To Write A Book In No Time. The author describes his method, following basic research, for writing a one-thousand-page legal treatise on the subject of corporations in five days. He then sets out his method for writing a number of his books in less than three days. He is convinced that you can do it too. His latest book is your road map to authorship and will encourage you and push you to the precipice of a great adventure...becoming an author. Mr. Snyder's instructions and his encouraging words include more than the nuts and bolts required to write your own volumes. He outlines, as well, the personal processes which led him to write books on no less than ten divergent topics, each requiring a special but simple technique. All you are required to know is what you know. Most writing, fiction or nonfiction, involves the author's past and present, the author's philosophy, religion and/or social situation, and, most importantly, begins with a dream and ends with an accomplishment. By following the admonition of Thomas Jefferson, "Always take hold of things by the smooth handle," you will learn of the remarkable shortcuts leading to your own publication. You will be inspired to live your dreams. You will be informed that the writing of a book is simple prose stretched just beyond everyday term papers and reports and simply is writing more than you have written before. You will learn that book writing requires no special training or even expertise. All that is required is that you be a person in history with a desire to convey information. You will learn that the purpose of writing your book ultimately is to assist others to enjoy and understand something which you already know, but they don't. Read this book, and then write your own.